Few life events are as transformative for women as having a child. And, no other expected life event has the potential to be so painful. These days, everyone’s mission is to avoid pain and sacrifice. We all know about the triumphs of women in the work world, but the one thing that distinguishes us from men – childbirth – is commonly met with confusion and cowardice. The majority of American women preemptively demand epidurals, before they even feel the first contraction. Some declare that they are “too posh to push” and schedule a C-section. Anyone who does minimal research knows that popular interventions carry some risks to both mother and child. Obviously, interventions should be used when needed, but we’ve somehow created a culture that expects easy and painless birth on demand. Still, most childbirth prep classes are designed to help women cope with the pain without drugs. I initially tried the ever popular Lamaze. However, I was one of two weirdos who really wanted to go completely natural in that class, so I moved on to hypnobirthing, or the Mongan Method. Hypnobirthing goes beyond mere coping and re-arranges your thoughts about birthing. Founder Marie Mongan challenges the popular notion of painful birthing through countless stories and linguistics. She points out that some translations of the Bible take the Hebrew word in Genesis 3:16, etzev, and tell us that it means “pain.” Women’s punishment for their role in original sin is supposed to include painful childbirth. Interestingly, the very same Hebrew word is used to describe the punishment for men. Some translations will use “pain” in Genesis 3:17 as well, but others prefer “toil,” “labor,” or “suffering” for etzev. Either way, the acceptable translations for both verses indicate struggle. But the frightful “p” word is only one of several options. Mongan moves beyond etzev and replaces common vocabulary with more palatable alternatives. The term “birthing process” is preferred to “labor.” Contractions were “waves” to me. The word choices sanitize any hint of discomfort and allow mothers to relax, which should theoretically lessen pain and allow babies (“hypnobabies”) to be born easily. Hypnobirthing put me in an ethereal mental state of “nothing can go wrong” that helped me manage early labor at home. Self-hypnosis recordings enabled me to calmly travel to the birth center. Once active labor kicked in though, everything went out the window. At the end of it all, I felt disillusioned. While I achieved my goal of having my son without so much as a Tylenol, the munchkin got stuck. 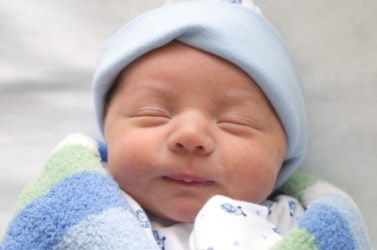 He finally came out with his head sideways – a feat that our midwife said was uncommon. While Mongan tells moms to gently breathe their babies down, hours of pushing seemed unavoidable in my case. This unanticipated fiasco nearly caused me to black out. I felt duped. Was I naïve to expect a comfortable experience? I know some women have an easier time than I did. The mom next door to us hardly whimpered as she had her baby. Mongan is correct. We cannot assume that every birth is all that bad. But, some situations are just plain excruciating and maybe even scary. No amount of linguistic summersaulting will change that for us. While the Mongan Method helps women take pride in their ability to give birth and confidently avoid unnecessary interventions, it didn’t make suffering particularly meaningful to me. To put it crudely, hypnobirthing can be like brainwashing yourself out of experiencing pain. How is that different from drinking away the pain of a loss? Either way, the experience is avoided and unprocessed. Without question, pain is difficult to deal with and no one approach works for everyone. We’re all trying to figure it out as situations hit us. But to me, the reality of pain and suffering means that old school Catholicism is still relevant in a lucrative self-help and medical industry that tries to bypass sacrifice at all costs. Self-help too often treats faith-based wisdom as irrelevant, or even something that should be eliminated from our memory banks. This is a mistake. We keep crucifixes in our churches for a reason. Sometimes, pain is meant to be experienced or conveys a message. Maybe God put it there for a reason. Easter’s resurrection isn’t as meaningful without Good Friday’s sacrifice. A few moments of agony can burn through all sorts of crud and leave us transformed forever. Who would we be without Christ’s suffering? While some people cannot see a reason for women to endure real birth pangs in the modern world of technology, I am happy that I was able to skip drugs that could have somehow hurt my baby. Sacrificing for the good of another in that moment was a big lesson about motherhood to me. I liked elements of hypnobirthing and benefited from aspects of it. It is an innovative approach to an unavoidable life event for many women. At the same time, I wish I had tapped more into my reservoir of Catholic treasures. We have some serious expertise on suffering. Our tradition can be used in conjunction with any new pain management method and can always help us with life’s biggest challenges. This is an interesting perspective. I often wondered how getting an epidural or pain medication during birth affects or alters our spiritual experience of child birth. My personal experience of 3 births with no pain management (aside from focusing and self talk!) were entirely different than my experience with an epidural. I feel like the epidural dulled the experience for me a bit…almost like I had missed something in the process. If I were to have another child, I think I would opt out of the epidural. I know my body is capable of the process! I attended childbirth classes for both my children. Glad I did, but during labor I quickly became overwhelmed and was given Demerol, glad for that too. I had no need to be a heroine. No regrets. Hypnosis for childbirth seems to be more about accepting the labor process and not fighting it. The pain is caused by fear and tension, neither of which is necessary for a holy or healthy birth. Hypnosis and “tapping into your Catholic treasures” are not mutually exclusive. I have my children at home, and am not afraid of the process – hypnosis is one tool in my kit and I am fully aware, present in the moment, and actively participating in the birth. I cannot say the same about my medicated deliveries. Maybe next time, try hypnobabies. And lower your expectations :o) If hypnosis were the same as chugging a bottle of Jack, you could try that, but I think that we both know that they are different on many levels. Confidence that God created your body to give birth and that he didn’t make any mistakes goes a long way towards relieving anxiety, which is very counterproductive during labor. Active Birth is a good book about positions which may help with malpresentations. Anything by Ina May Gaskin is good for understanding physiological birth and really understanding the beautiful way we are created. Don’t be discouraged – you were designed to be able to give birth. Managing anxiety and tension does not have to remove the spiritual meaning of the birth. I took a 12 week Bradley course before my first was born and I ended up screaming for an epidural 11 hours into our 19 hour labor when he flipped to posterior. I really felt like I might have blacked out or died without the help. With my second labor, I lasted 11 hours before I begged for drugs. Conversely, I recently had a cavity drilled sans narcotics, as I’m pregnant again and the dentist suggested if I could handle the discomfort, it might be best for baby. All things considered, I’d have my entire mouth root canal-ed without so much as an aspirin before I’d attempt natural birth again. Every woman’s body works differently, and thank God we now have the tools to lower the maternal and fetal mortality rate so significantly in this day and age. Anything involving hypnosis is not of God and is of satan. If you truly believed in God or His Word (the bible) you would know this. Pain is not caused by fear and tension Susan, it is a NATURAL human response. Anyone knows that. You’re an idiot. God doesn’t relish his people being in pain. Hypnotherapy and all new age alternative therapies are not to be practised by catholics as you are leaving youself in a level of subconscious state an evil spirit can enter you. This is not a joke its dangerous.after effects can come later.see apriest if you have had any involvement in these.